Japanese laurel, (Aucuba japonica): growing, planting, caring. This shrub was highly popular in the 70’s, and it really is ‘Stayin’ alive’! 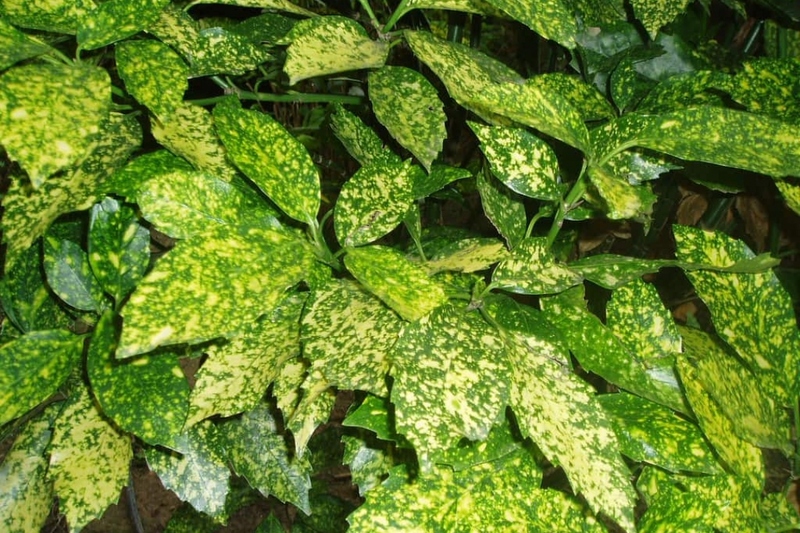 Aucuba japonica - the Japanese or spotted laurel, Japanese aucuba or gold dust plant in the US - is a medium-sized shrub native to rich forest soils of moist valleys in China, Korea, and Japan, and commonly seen in gardens - often in variegated form. The leaves are opposite, broad lanceolate, and the flowers are small with four purplish-brown petals. It is valued for its ability to thrive in the most difficult environments, even dry shade, and also copes with pollution and salt-laden coastal winds. It is often seen as an informal hedge, but may also be grown indoors as a houseplant. Today numerous cultivars are available, with the most popular cultivar being ‘Variegata', with yellow spots on the leaves. Plant aucubas from October to March outside the freezing period - planting before winter allows for better rooting - in the sun or partial shade. The aucuba gladly accepts any type of soil as long as it is drained. Before planting, prune damaged roots and branches to balance root volume and aerial volume. Plant in a hole at least twice as big as the root ball. Basin the roots before planting, it will greatly improve the chances of recovery. Do not bury the base of the trunk while planting. Form a bowl around the foot that will be used for watering during the first months. Tamp the soil around the roots - do not hesitate to use all the weight of the body! Finally water until filling the planting bowl, at least two watering cans! In pots, plant in an ordinary potting soil on a layer of gravel for drainage, in a tray or a very large pot. Water especially the first weeks, depending on the weather. Beyond the first year, you should not have to care much about it. Proceed with copious and infrequent watering, to encourage the root system to fetch water in depth. It is therefore advisable to water until satiety - until the "planting basin" is filled, and empties only very slowly. The trimming of aucubas is very simple. In February-March, clear the heart of the plant by removing some of the forks to keep only the most beautiful branches.